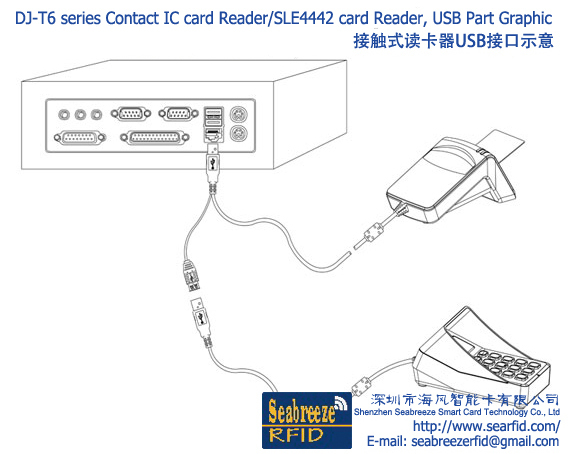 DJ-T6 series Contact IC card Reader are dual large card holder, have solved most of the certification card reader which is should be built-in-card died. It greatly improves the system's cases and convenience as the front-end integration of the necessary processing equipment of IC card system, and IR can provide more excellent service in the smart card application system, as if in industry, commerce, telecommunications, postal services, taxation, banking, medical, a variety if charges, stored value and query. Support card type: CPU card(T=0, T=1); All popular memory cards, logic encryption card such as AT24CO1A, 24C16, SLE 4418/4428/4432/4442, SLE5528/5542. DJ-T6 Contact smart card reader is available in both USB and RS232 (Serial) interface, which can be easily integrated with PC and other related hardware...It includes up to two smart card slot and 2 SAM card slots. With the human engineering science design, DJ-T6 is easily operate by one hand. This design is very helpful for those fast past environment which require smart card. DJ-T6 readers can support at most 4 card slots. The main card slot is for regular use. The assist card set is easy for input administrators to use for attestation and management use. It solves the problem that when most readers identify cards they must use internal SAM cards. At the same time, for compatibility and multi attestation consideration, it adds 2 internal SAM card set. The device supports T=0 or T=1 cards. It is an ideal solution for supporting dynamic upgrade of code and application, 3DES-based encryption for server and reader authentication and secure PIN management. A 16M/32M/64M U Storage and encryption as a special feature makes DJ-T6 different and convenience than any other readers in the market. The U Storage can be use for file or data back up, and also can store as a auto run software for DJ-T6 which makes no more driver problems. With the encrypting feature in the reader, it can turn the system into more secure than before. Size, logo, and casing can be customized.